Supervisor Gonser accuses creators of this website of ‘cowardice’ while he refuses to admit HE made unauthorized request! At the August 13th Board of Oakland Township meeting, several citizen made comments about this website. Supervisor Gonser responded by saying that the creators of this website were cowards and should appear at the meetings ‘in person’. One of the creators of the website WAS present for the beginning of the meeting. He was not present when the Supervisor made his comments. The author of this post was on vacation, and watched the entire meeting using the Township’s website. For the record, and to the dismay of Supervisor Gonser, I have made many comments at Board meetings, challenging the Board on many issues. He has cut me off at the 3 minute limit, while he has allowed others that share his views to continue for much longer. So WE are cowards because we document the FACTS on Board issues and share them with citizens who do not have the time to watch all the meetings and “CONNECT THE DOTS” themselves? Supervisor Gonser did not speak up when he knew he authorized the work on the Park parcel! He made accusations of cowardice when two of the creators of this website were not present! SO WHO IS REALLY THE COWARD? Someone once told me “If the truth hurts, it is because you do not like what it says!” I will let the readers decide who is truthful and who is a coward. If you are a concerned citizen of Oakland Township, I would encourage you to come to several of the Board of Oakland Township Meetings, and voice your opinion on matters. The current Board has a small group of citizens that always participate supporting the Board’s point of view. Diverse opinions are needed to protect Oakland Township’s future from being defined by this small group. Here are the videos confirming the above statements. This entry was posted in A new kind of "Transparency", Board vs. Parks, Ethics, Supervisor Gonser and tagged Abuse of Power, Board vs. Parks, Dictatorship, Misappropriation of funds, oakland township, Parks and Recreation, Supervisor, Supervisor Gonser, Terry Gonser on October 2, 2013 by richardjmichalski. Abuse of Power and a Misappropriation of funds? 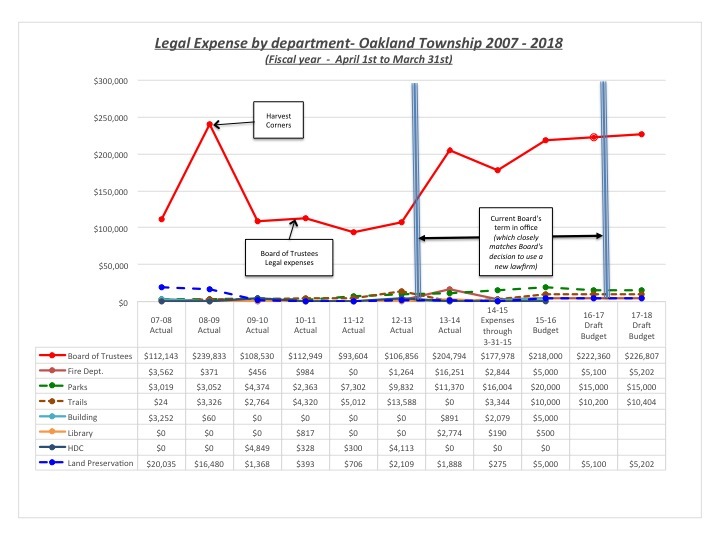 At the August 13, 2013 Oakland Township Board meeting, Trustee Keyes asked who authorized the expenditures for the Marshview Connector Parking lot work. She discovered that neither the Parks Commission nor the Trails and Safety Paths Committee asked for, or authorized, the clearing of brush and preliminary design work on this project. However, someone had requested the work and directed that the cost for the work be shared between the Parks and Recreation Budget, the Trails and Safety Path Budget, and the General Fund. The first represents a potential abuse of power by either Supervisor Gonser or the Township’s administrative staff. The second is a potential misappropriation of funds by the Township Board. The Parks and Recreation Budget is the responsibility of the Parks Commission. The Township Board does approve the Park’s Commission budget, but it does not have authority to authorize work on Parkland, or spend money against the Parks Budget without the Parks and Recreation Commission’s approval. The questions raised by Trustee Keyes at the August 13 meeting went unanswered at that meeting, as well as the September 10th Board meeting until aggressive questioning resulted in Superintendent Creech stating that Supervisor Gonser approved both the clearing of the land and the allocation of expense to the Park’s Commission’s Budget. The Board then proceeded to not only approved the questioned bills from the August meeting, but added several other bills pertaining to the same project by a 6 to 1 vote (Keyes voting nay). At the September 11th Parks and Recreation Commission meeting, the Commission agreed to pay for some of the expenses that were incurred on this project, but not the previous bills. Many citizens indicated they do not understand the importance, or the significance, of this situation. One citizen has stated that the Park’s Commission has “overplayed’ this issue. However, the autocratic decisions made by Supervisor Gonser, or the Township administration at his request, represent an abuse of power, given that the Parks and Recreation Commission has autonomous authority. The unauthorized allocation of costs for the unauthorized work to the Parks Commission Budget appear to be a misappropriation of funds. The Parking lot project is not in the Parks and Recreation Commission’s 2010-2014 Master Plan. At the April 10 Parks and Recreation Commission meeting, during citizen comments, Trustee Thalmann introduced the request for adding a Parking lot on the Marshview Connector Park located on Orion Road, just South of E. Clarkston Road. She stated that Supervisor Gonser had a keen interest in this project. At that meeting, a subcommittee was set up to participate with Trails and Safety Path Committee and Township Board members to review the request. On May 13th the representatives from the Parks Commission, Trails and Safety Paths Committee, and the Board met at the site to discuss the potential options for the site. On May 20, an Engineering firm, that was getting direction from someone other than the Parks Commission, submitted a Proposal for the Marshview Connector Park to Mr. Creech, the Township Superintendent. On May 22 the Engineering firm was asked by Mr. Creech to prepare a presentation for that evening’s Parks Commission meeting. It was not on the agenda for that evening’s meeting. At the Parks Commission meeting that evening, the Engineering firm apologized for the low level of information provided because of the late request for the presentation. The Parks Commission was informed that Supervisor Gonser wanted the project to be completed this building season, and desired that the Parks Commission approve a Special Land Use request to the Planning Commission. In a spirit of cooperation with the Township Board, the Parks Commission recommended that the Township Board approve a Special Land Use request, even though they did not have any significant information on the proposal and were not directing the project. On June 4th, the Planning Commission accepted the Special land use plan for study. On July 2nd, the Planning Commission held a public hearing on the plan. There were a number of issues raised including slope and grade issues with the proposed pathway, as well as the overall location of the path and the parking lot on the parcel. At that meeting, concerns over the funding for the project were discussed, but it was determined that those issues were outside the Planning Commission’s responsibilities. This topic was placed on the August 7th Planning Commission agenda. Prior to the August 7th meeting, but after the agenda was published, Parks Commissioner Chair Mackley requested that this topic be tabled since they had not requested it be placed on the agenda, and that they had not reviewed the information that was to be presented since they had only received it on August 2nd. The Parks Commission did not have a meeting scheduled between August 2nd and August 7th to review the plan that had been developed. After much discussion at the August 7th meeting, the Planning Commission tabled the topic. At the August 13 Board meeting, Trustee Keyes identified expenses associated with the Proposed Parking lot project that were to be charged to the Parks and Recreation Budget, as well as the Trails and Safety Paths Millage Budget. This work had not been requested or directed by either of those groups. As a result, she asked who authorized the work. When she asked who authorized the work, there was absolute silence from the Board members. At the September 10th Board meeting, Trustee Keyes indicated that she had not received ANY response to her request for information on who authorized the work and who authorized the appropriation of the expenses to the various accounts. Clerk Reilly had not responded to her written request. At the September 10th Board meeting, Superintendent Creech commented on who authorized the work and who authorized the allocation of expenses. At the same meeting, the Chairman of the Parks and Recreation Commission as well as the Parks and Recreation Director commented on how this project has been handled. At the September 11 Parks and Recreation Commission meeting, the Commission agreed to pay for $1,059.51 of the expenses incurred on this project, but not the previous bills that were under dispute. Parks Commissioner Barkham indicated that there should not be any further expenditures on this project without concurrence from the Board, the Parks and Recreation Commission, and the Trails and Safety Path Committee. Why is this important to the citizens of Oakland Township? The division of responsibilities between the Township Board and the Parks and Recreation Commission are clearly defined. Having the Supervisor make decisions on park land for one of his “pet projects” exceeds the authority that the Supervisor or the Board have over the Parks and Recreation Commission. The booking of the expenses for the work done at the Supervisor’s request against the Park’s Budget is a misappropriation of funds. Do you think that Supervisor Gonser knew who authorized the site plan and the work that had been done on the site since the project was moving forward at his request? Do you think Supervisor Gonser was silent for 20 seconds when asked who authorized the plan was because he was reluctant to admit that he authorized it with the video camera running? Do you think Clerk Reilly should have responded to Trustee Keyes’ August 13th verbal request and her follow-up email requests? Do you think Supervisor Gonser played a role in Clerk Reilly’s lack of response to Trustee Keyes request? Is this the type of leadership you want in our Township? This entry was posted in A new kind of "Transparency", Board of Trustees, Board vs. Parks, Ethics, Supervisor Gonser, Trails and Safety Paths and tagged Abuse of Power, Dictatorship, Misappropriation of funds, oakland township, Parks and Recreation, Parks Commission, Supervisor Gonser, Terry Gonser, Trail on September 28, 2013 by richardjmichalski.